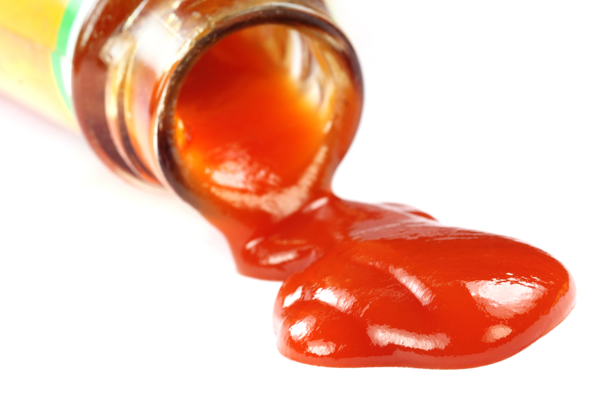 After failing to get any ketchup out of the nearly empty bottle at a barbecue, a group of engineers, scientists, and the like gathered to solve the problem of condiment frustration once and for all. What they came up with was an ultra-effective non-stick coating that’s so slippery that even something like ketchup will slip right out as if it were water. If you don’t believe me, take a look at the video (after the jump); it’s like the ketchup I put on my burgers in my dreams. Food companies have tried to help us get more out of our bottles by shaping them differently or making them stand on their tops while in the fridge. Nothing comes close to this coating, though, and I don’t want it to stop at ketchup, mustard, and mayo bottles. I want some of this on my rice cooker, and frying pan, and everything in my kitchen. The coating is non-toxic, and it’s easy to apply to the inside of condiment containers. So say bye-bye to whacking the bottom of the ketchup bottle. I especially want to see this on barbecue sauce bottles. What about you? Let me know what you think in the comments! Like this? You might also enjoy..